Do you have a booking cut-off time? A. Bookings made by 11.00am EST weekdays can be picked up by the majority of our carriers on the same date for capital cities and major regional centres. Do you charge by deadweight or cubic volume? A. 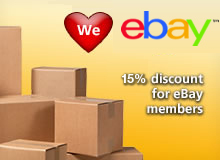 We charge by whichever is the greater for that particular consignment. Our price quoted to you will include any cubic charging if necessary. Can I use your services if I am the receiver of freight? * You must forward the PDF consignment-label (you will receive a copy via email shortly after booking) to the sender of the goods so they can print the label and stick it to the goods ready for pickup. The driver will refuse to pickup the goods otherwise. * You must inform the sender of the pickup date and time window nominated by you in the booking. If we attempt pickup from the sender and cannot collect the goods, you will incur an additional $25 Futile Booking Fee which must be paid prior to Smart Send rescheduling another pickup. Can you deliver to Post Office boxes? A. No. Only Australia Post can deliver to PO Boxes. Are your prices inclusive of GST, Fuel/Security Levies and credit card/Paypal surcharges? A. Yes. Unless stated otherwise. Can you pickup from Gray's Online branches. A. Bookings may be altered or cancelled no later than 10am on the date of pick-up by notifying us through the Customer Service link on our homepage and providing your Consignment Number (a 5% cancellation fee may apply for all cancelled bookings). If cancellation occurs after 10am a Futile Booking Fee may apply. Do drivers call on approach to pickup or delivery? 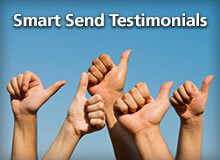 A. Casual Customers do not have to meet any volume or expenditure requirements. 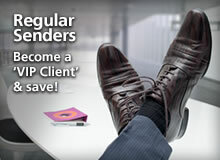 VIP customers can receive further discounts but must meet volume requirements each month. A. Payment is pre-paid online by credit card (Visa, Mastercard, Bankcard, Amex, Diners), Paypal or 'Smart Top-up'. A. You must ensure someone is available to consign the goods on the nominated day and time of pick-up from the pickup address (unless you choose the 'Unattended Pickup' option on our booking form and each of your items is under 25kgs in deadweight). We will charge you an additional $25 "Futile Booking Fee" if we cannot collect the goods at the specified time and location. If this is a concern, you may consider taking the goods to your place of work and we can pickup from there. If you choose this option, ensure you nominate the correct address and time window when booking on our site. A. This means the delivery driver will ask the receiver to sign for the goods as delivered. If no-one is available to receive the goods, the driver will leave a card at the delivery address, asking them to call the local transport depot to organise a re-delivery (or pickup from the depot if they prefer). Transport Assurance is not included in this service. Do you insure my goods whilst in transit? A. Smart Send does not have an insurable interest in our customer's goods; therefore we do not provide insurance cover during transit. 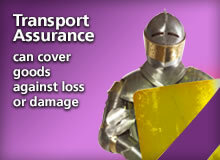 However 'Transport Assurance' is available for loss or damage to goods in transit. This can be added to your booking via the Quick Quote section on our homepage. Certain goods are excluded, please read the Transport Assurance Conditions for further details. Yes. The service is "Door to Door". Our competitive quote means you don't have to leave your premises to drop off the goods at a bus depot or post office; saving you down-time from work or your family life. There are some exceptions: e.g. for 'remote areas' of Australia, farms and some locations outside of regional towns that are not serviced by transport companies. If you are uncertain, email us and we can confirm for you. How do you compare in price with other transport providers? A. We are very competitive with all the major carriers. Plus you will never be charged Account fees or have Minimum monthly trade requirements to meet as a Casual Customer. Do you organise packaging or despatch of goods? We do not package goods. Product sent via Smart Send must be packaged correctly by the sender and each item correctly addressed, with our consignment-label/s (provided via email upon booking) firmly stuck to the goods ready for the pick up driver to collect. Pick Up drivers may refuse incorrectly packaged or addressed goods (if this occurs, we will charge an additional "$25 Futile Booking Fee"). A. Yes. We can carry items up to a maximum of 4 metres in length. Can you deliver to offshore islands in Australia? We can only deliver to mainland ports which service the islands via barge services (e.g. Shute Harbour is the mainland port for Hamilton Island and the other islands nearby). The receivers/businesses on the islands will generally have an account with the barge service to arrange delivery to the island from the mainland port. A. Smart Send has relationships with a number of respected 'proven' freight/courier companies in Australia that provide B2C delivery services. Our site will provide various transport options and you can then decide on your preferred delivery method (e.g. cheapest, express, etc). Do I have to package my goods for transport? A. The majority of goods must be packaged into a carton or crate for transportation. Goods on skids/pallets must still be packaged into a carton or crate and strapped to a skid or pallet (pallets will not be exchanged). Failure to package your goods as required will result in drivers/depot staff refusing your consignment and a "Futile Booking Fee" of $25 will be charged to you. Check the Packaging Guide on our homepage for advice on how to package your particular item. Used 'White goods' (washing machines, dryers, refrigerators, etc). We will accept these items if they are new and packaged in their original packaging and box. We also reserve the right to decline transport of any consignment if we so choose. Please read our Terms and Conditions for full details.